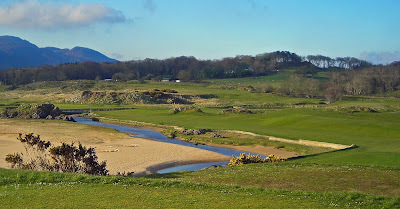 It all started so innocently… one of Portsalon’s former Captains is married to Paul McGinley’s sister… so Paul received an invitation to play at one of Donegal’s finest links courses. After the round he was asked for his opinions on the course, so he made a few comments... and Portsalon set about implementing them. After a small portion of work was completed, Paul was invited to give some feedback. And once he had expressed his approval, he was formally invited to work on the revamping of Portsalon Golf Club. For those who don’t know, McGinley was the man behind Macreddin Golf Club in Co. Wicklow. Now, let me point out, Portsalon has a huge amount going for it already. Its location is breathtaking (the beach, the bay, Knockalla Mountain), the shape of the land and dunes is magical and the quality of some holes is exceptional – the par four 2nd is indisputably one of the best in the country (even Paul McGinley said so)… so the question is, what was McGinley going to do to make the course better still? Johnny explained that McGinley wanted to introduce traditional revetted links style bunkers, with steep faces. To make the course more player-friendly, you only need look at the Index 1 par four 6th, where the fairway has been widened to make the hole more accessible, and the green has been extended into the hollow on the left thereby making it less punishing. 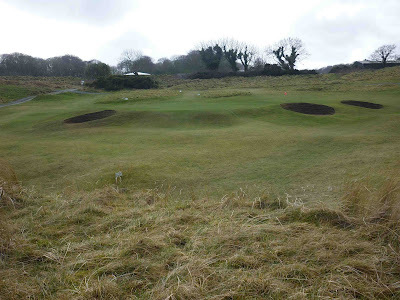 On the brilliant 2nd, the club closed the three bunkers that ran along the right hand side of the green, which were impossible to see from the fairway, and replaced them with one revetted stlye bunker at the front right. "The reason for this was that Paul thought the hole was tough enough for the average golfer without them hitting good shots and getting penalised when they got up to the green, only to find there ball in a greenside bunker. As the course is reshaped, the length will stay approximately the same. Some holes will be lengthened and some shortened, while there will also be some green extensions. The current gravel paths will be turfed over to give it a more natural look and feel. A five year plan may seem like a long time, but the work is taking place during the autumn and winter months so that the course stays open for play as much as possible. It also spreads the costs of the work. And bear in mind that the work is all being carried out by the in-house greenkeeping team… which numbers just four. Let’s hope it stays that way and Portsalon gets the recognition it deserves. Really interesting to hear that Portsalon is still gradually improving. 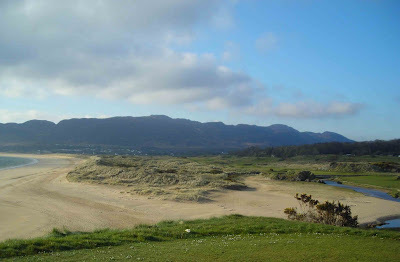 I cut my golfing teeth at Portsalon as a kid and still struggle to think of a course that offers such range of golf. Some parkland, some links, some target golf, some for the booming drive. A mild, playable summer day can turn to 25mph in your face and back again in a round. Pure, unpretentious golf at its best.